Contract Manufacturing at Jubilant HollisterStier’s Spokane, Washington facility is located in a 190,000ft2 facility situated on 20 acres in Spokane, WA, USA. Jubilant HollisterStier has become recognized globally for our quality and project execution, strong regulatory track record and ability to provide advanced services to customers. Highly skilled, cross-functional teams provide custom solutions to customer-specific project goals from site transfer through commercialization. Our Spokane facility is designed for multi-product operations and houses 3 separate manufacturing areas that include two commercial high speed fill lines and a clinical trial area. 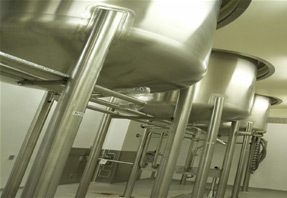 All of our filling lines are integrated into lyophilizers that range in size from 30 ft2 to 375 ft2. Jubilant HollisterStier Spokane offers multiple options for compounding including aseptic compounding, portable compounding vessels and large fixed compounding tanks. The vial and inspection areas include visual inspection, labeling, Ink Jet coding and secondary packaging. 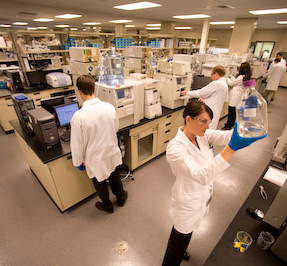 Onsite, this facility offers a full-service 190,000ft2 laboratory that includes quality analytical testing services with an analytical chemistry department that is staffed by highly-trained, credentialed technicians and scientists. Microbiological support services are also provided. Jubilant HollisterStier does not manufacture penicillin or penicillinontaining products, cephalosporins, live bacterial or live viral vaccines. Jubilant HollisterStier Contract Manufacturing operates a fully integrated manufacturing facility in Montreal, Canada. Manufacturing operations include sterile and non-sterile processing, lyophilization, packaging and warehousing capabilities supported by an experienced quality team with on-site laboratories. The Montreal facility is built on a robust foundation stemming from over 30 years of experience. Our strategy for success is based on outstanding quality, international regulatory compliance and superior technology transfer capabilities. Jubilant HollisterStier is diligent with our regard to quality across our facilities and our Montreal site has the approval of FDA, EMA, Health Canada as well as many other international regulatory agencies. Routine quality audits for a variety of regulatory agencies and clients have ended in positive results, demonstrating our integrated commitment to vigilance and quality systems. Our clients work alongside dedicated project and account managers who understand their technical requirements and expectations. 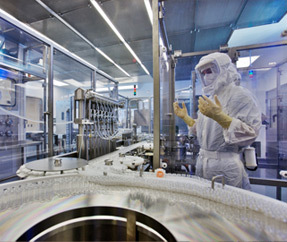 We also house manufacturing facilities for non-sterile ointments, creams, gels and liquids. The team at our Montreal site prides itself on implementing a strategic mix of responsiveness and expertise to provide our clients high quality sterile and non-sterile manufacturing services.